My substance painter no have opened. I just installed the program and when I run it, it says it stopped working as shown in the following image. Obs (I'm Brazilian, so the image is in Portuguese). 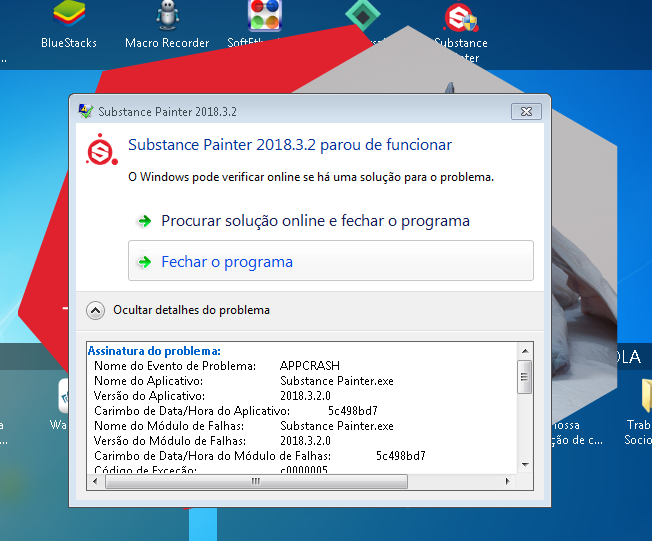 Integrated graphics cards are unsupported by Painter. You need a dedicated graphics card with at least 4GB of VRAM. You will also not get happy with just 8GB of system RAM, Painter alone will - depending on the project - easily consume more than 10GB of RAM, and you will need memory to run your OS and other apps simultaneously. More precisely : for Substance Painter we support (but do not recommend) some integrated GPUs, starting from HD5000 and above, with at least 2GB of VRAM. The OP's GPU is unfortunately not supported.